Cleveland Wall is a poet, editor, and performance artist. Her work has appeared in Philadelphia Stories, Schuylkill Valley Journal, and Lehigh Valley Vanguard. 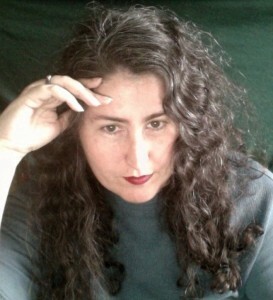 She is a poetry workshop leader and a book consultant for both poetry and prose manuscripts. Amongst other poetly duties, Cleveland hosts the visiting poets series for the Allentown Arts Collective and creates small-edition, handmade chapbooks. “It sounds like the observations of an extraterrestrial.” That is my all-time favorite description of my work, as I am always striving to maintain a degree of uncertainty about even the most mundane things—especially the most mundane things. My process is founded in observation and the gathering of lore, language, and imagery as raw materials. How this prima materia becomes a poem I am never quite sure, since my subconscious mind is in charge of that step. Once the poem begins, I am consciously shaping it with attention to sound, line breaks, and whatnot, while at the same time trying not to steer it too willfully. It is a tricky state of mind, at once focused and unfocused. As an editor, my task is to help the poet to convey his/her vision as fully as possible. It’s a very different process from creating; this is all focus. I examine the language for clarity and specificity, consider how well the structure of the piece fits the content, whether the tone is consistent throughout and whether it needs to be. I offer as many different approaches as I can and encourage the poet to find the solution that works best with his/her distinct voice.